A nosebleed or epistaxis is a loss of blood from the inner lining of the nose. Then what causes nosebleeds? Also called nasal hemorrhage, nosebleeds occur because the nose has many blood vessels that can bleed profusely even with minor injuries. Aside from injury, what causes nosebleeds in people who experience them frequently? This is quite rare, but it is important to get proper evaluation and treatment. Nosebleeds may be categorized according to their origin, which is either in the anterior (front) part of the nose or the posterior (back) part of the nose. Let's look at what causes nosebleeds by type. 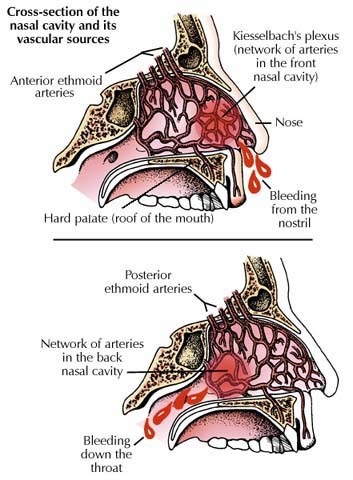 Bleeding from the lower portion of the nasal septum (the wall between the nostrils) causes anterior nosebleeds. This area contains delicate blood vessels that receive blood flow from the neck arteries. A slight bump on the nose can cause anterior nosebleeds, which are easily controlled with home treatment. This is common in children. Posterior nosebleeds originate higher up and further back in the nose where larger artery branches go to the nose, causing serious, heavy bleeding that needs immediate medical attention. These are more common among adults. What Can You Do If Nose Bleeds? Pinch the nose firmly while breathing through the mouth. Sit up and lean forward to reduce blood pressure and prevent blood from going to the throat and sinuses. Continue pressing the nose and sit while leaning forward for 5 to 20 minutes, until the blood begins to clot. Seek medical help if bleeding persists beyond 20 minutes. Place an ice pack over the nose and cheeks to stop the bleeding. Avoid stressful activities. For re-bleeding, use a nasal decongestant to spray the nose and constrict the blood vessels. Limit using the spray or avoid using it if you have high blood pressure. Anterior nosebleeds usually stop within a few minutes using home treatments. However, posterior nosebleeds are usually more serious and require medical care. Treatments may include packing the bleeding nostril, sealing off bleeding blood vessels, or inserting a special inflatable balloon to apply pressure to the bleeders. 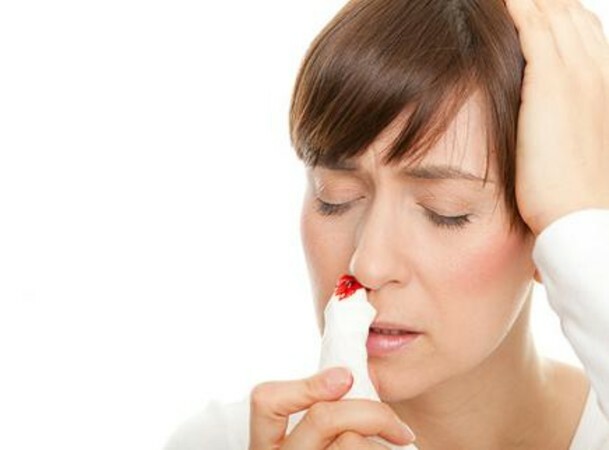 Seek medical attention if you are suffering from frequent nosebleeds, which may be related to an underlying problem, a previous head injury, or use of anticoagulants (blood thinners). Keep the air moist. Using a humidifier in your home helps keep the air moist, especially if the climate is dry. Avoid picking your nose or blowing it too hard. Apply a lubricating ointment. Petroleum jelly (ex. Vaseline) can be applied inside the nose to prevent crusting, especially in children. Avoid straining yourself. Too much straining, bending or heavy lifting can cause nosebleeds. Avoid using medications that can cause bleeding. Examples are blood thinning medications such as Coumadin, aspirin, ibuprofen, and clopidogrel (Plavix). Ask your doctor about these medications, and do not stop taking them beforehand. Do not smoke. Smoking causes nasal dryness and tissue irritation.